Yesterday was another exciting milestone for the Littlest Brewster: her first visit to the dentist! I had actually put LB on my dental insurance over a year ago but had somehow never managed to make her an appointment for her first cleaning. 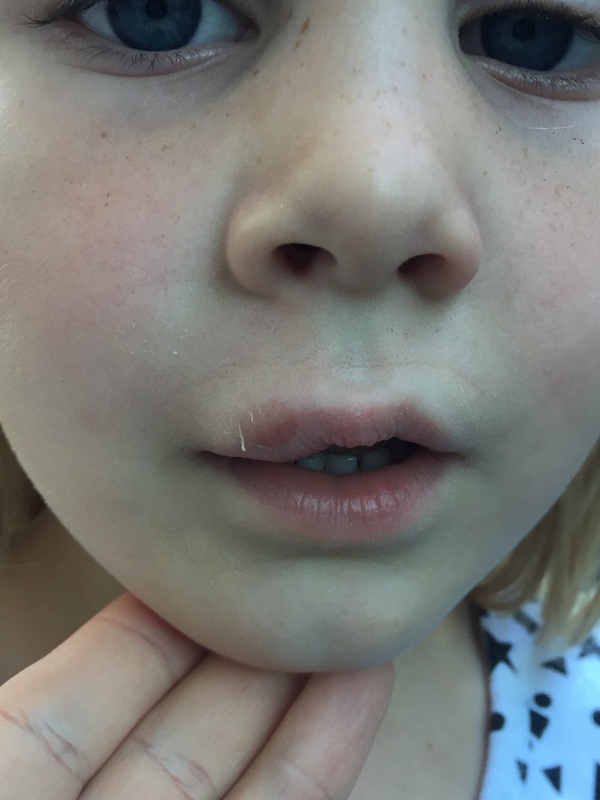 This was mainly due to not knowing whether we should take her to a pediatric dentist or just a general dentist. Our dentist assured me that they were more than capable of caring for small kids but I ultimately decided that we’d probably have a better experience with someone who deals only with little ones (This may or may not have been influenced by my dad admitting to me that his philosophy as a general dentist when dealing with kids was, “Be quiet and open your mouth.”) After getting a recommendation from our pediatrician, I called to set up an appointment. Well, the big day finally rolled around and LB was very excited. We had made a point of talking up how fun it was going to be, so I think there was very little apprehension. I had briefly toyed with the idea of getting a book or two about going to the dentist but never got around to picking one out on Amazon decided against it. Sadly, I forgot to bring my camera to the dentist so I don’t have any pictures of the momentous occasion. But take my word for it – she did awesome! The whole office was decorated as a jungle, with a bajillion stuffed animals around for the kids to climb on and play with and generally harass. And of course, each chair had a tiltable TV over it with a redonculous selection of movies. So LB got settled in with a stuffed tiger on her lap and Frozen playing above her and she was good to go. 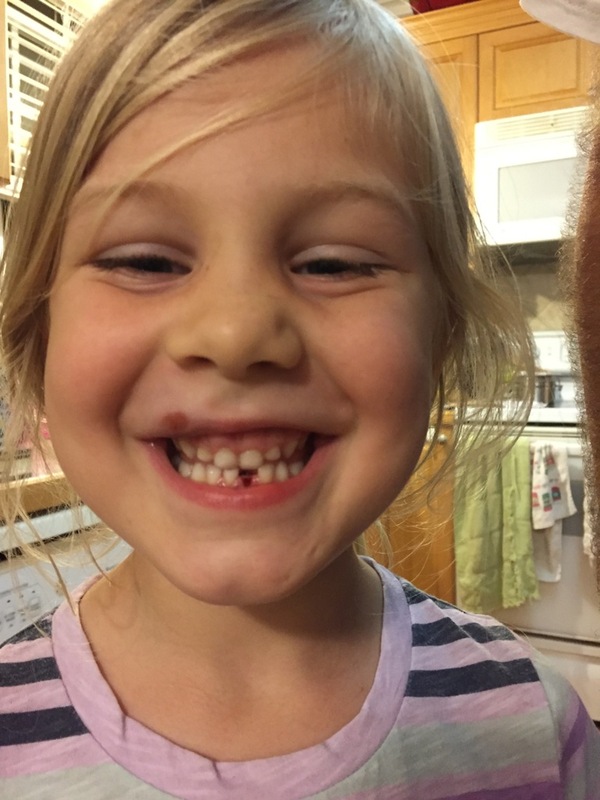 She got a little squirmy when they were scraping some plaque off her teeth but tolerated the polishing and flossing really well. LB got a generally clean bill of dental health. There is one spot on the surface of a molar that they said we need to pay careful attention to, as it’s a little stained. 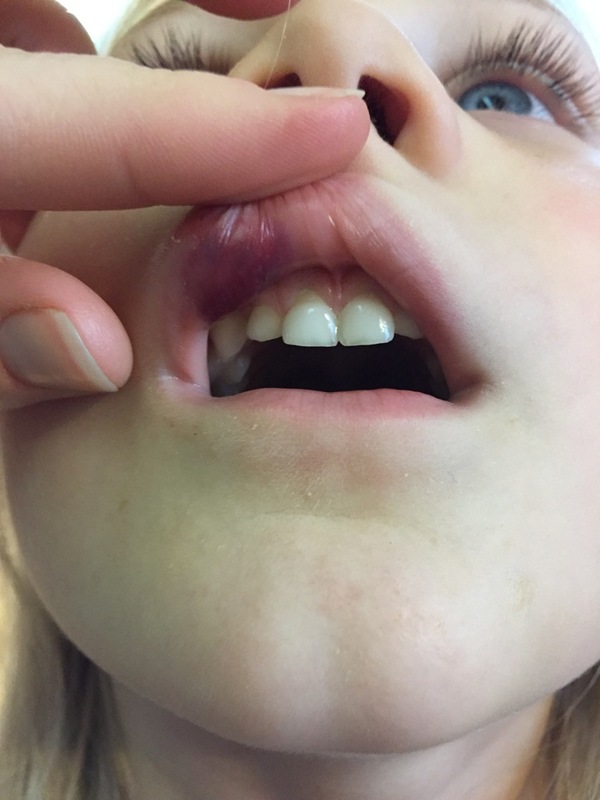 And the x-ray of her front teeth showed that she cracked the root of one when she feel and busted her teeth against the toilet 4 or so months ago. But that doesn’t require any follow up other than a repeat x-ray in a year, so no big deal. When the DreadBrewer and I moved into our house, we didn’t actually plan very well for the day in the future when we would have a kid as we were deciding which room would be which. This meant that when I was pregnant with the Littlest Brewster, we had to do a bit of juggling to turn the guest room into her room and the bonus room into a guest/bonus room. And we were sure we were set. But we didn’t plan at all for the day in the future when we would have two kids. Well, then I got pregnant with BIT and we realized that we’d never fit two kids into the room LB was currently occupying. (Because we’re jerk parents like that who are planning on making their kids share a room.) Her room is nice and bright because it’s got windows on two walls, but add in the door and the closet and there’s not a single unbroken wall. Which was seriously hampering my plan to get bunk beds for the kids. So I looked for a solution to my dilemma. And you know which room had a long unbroken wall? DB’s office. I think I may have mentioned this before, but my dear husband is a packrat of the the first degree. If there were a Nobel prize for hanging on to random miscellany from the past, the DreadBrewer would win without even trying. When we moved into our house, I told him the office was his to clutter up as much as he liked provided he made an effort to keep the crap necessary things in the rest of the house to a minimum. This has been sort of hit or miss, but he tries. Given that we needed the office to be the kids room (and DB graciously agreed to my messing up his “system” with a room switch), we were faced with the serious dilemma of how to get everything where it needed to go. This ended up being a two weekend process that was exhausting. First, we moved the stuff from the office into the bonus room. It was a lot of stuff to move. Then we had to clean the carpets in the office and let them dry. Then a few days later we had the bunk beds delivered and set up. And then the next weekend we had to commence the most difficult (read: most anger and shouting inducing) part of the whole process: move LB’s stuff to our room, move the office stuff to LB’s old room, and then move LB’s stuff into her new “Big Girl” room. (Why couldn’t we just move her stuff straight into her room, you ask? Because we had never gotten the computer desk out of the old office, which was a big roadblock for our plans to put her furniture in that room.) And then we had to clean up the bonus room. About 30 minutes into the rearranging, I realized that I had seriously miscalculated how big the crib and dresser from the nursery are. There was NO way that both of those pieces were going in the Big Girl Room easily or well. Since BIT and I are planning on being in the bonus room for a bit anyway (at least while I’m on leave and DB is not), we compromised by putting the crib in the bonus room and sliding part of the dresser behind the bunks. This makes one section of the dresser inaccessible and it doesn’t exactly look amazing, but we hardly ever used that cabinet anyway and it means we don’t have to buy or sell any furniture. DB has admitted, after the ordeal of switching rooms was behind us, that the office is much nicer and brighter now than it was before. Once we got the beds in place, I realized that we needed something in place to keep the Littlest Brewster from going up the stairs at night and falling to certain doom. So I had a piece of plywood cut to fit the opening and then wrapped it in a length of fleece to keep the wood from scratching our fancy new bunks. The fact that the pattern ended up skewed rather than straight drives me absolutely crazy. But a) I don’t have enough fleece to redo it and I’m not about to buy more just satisfy my neuroses and b) I figure it’ll be good practice for letting go of the little things that I know will be necessary if I’m to survive the transition to two children. The first night we put the Littlest Brewtser to bed in her big girl bed I was so nervous. I was worried this was going to be a horrific transition and everyone would end up crying by the end of the night. Surprisingly enough, it went really well. As long as one of us gets in bed with her for a few minutes to tell her a story, she’s pretty content then to just go to sleep. She is also still really proud of the fact that she’s sleeping in her big girl room all by herself. (A fact of which she informs us every morning.) The first nap out of the crib was a little more difficult, but we seem to have conquered that as well. It was a day of firsts! We had not one, but two awesome firsts today!!! 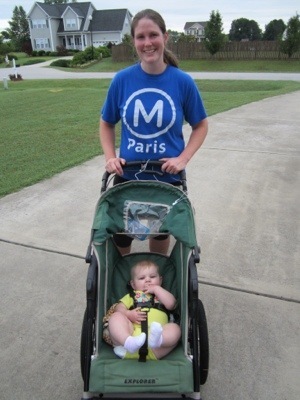 I, on the other hand, am not used to running without pumping both arms, nor am I accustomed to pushing a stroller complete with 18+ pound baby up and down hills. 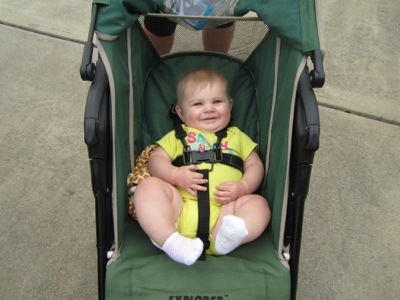 I alternated between pushing her with one hand while moving the other and trying to push the stroller with my stomach while pumping both arms (neither effective nor attractive, I’m sure). Needless to say, I was not running my usual 9-10 minute mile and there were definitely more walk breaks than usual. I’m going to take her out again tomorrow to give both of us more time to get accustomed to it. Once I learn how to actually run with the damn thing, it’ll be awesome to be able to take her with me whenever I want to go for a run as opposed to working it in around DB’s schedule. 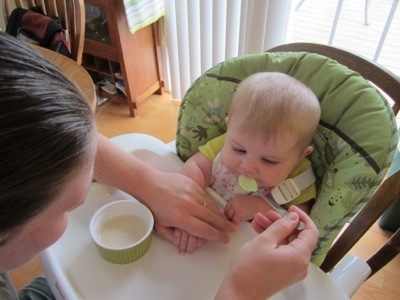 The next first LB did today was extra super exciting – she tried her first solid foods!!! We started with rice cereal because a) someone gave us a box of it and it was handy, b) our pedi recommended it as a first food since its unlikely to cause an allergic reaction, and c) we don’t have to use it within 3 days or toss it (highly unlikely if we open a 2.5 oz jar of baby food for an infant eating a teaspoon of food at a time). 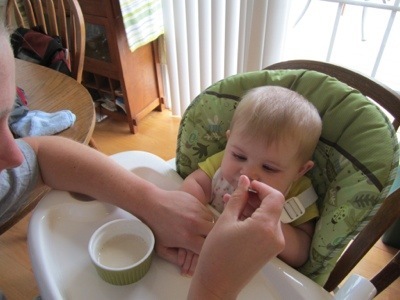 The plan is to make our own baby food, but that’s pretty hard to do for rice, or so I believe. I’m going to get a squash at HT tomorrow and try making some to have on hand for next week. 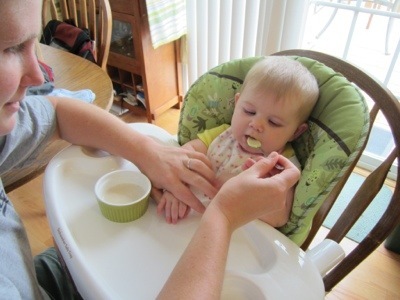 I’m sure there are many posts on making baby food in your future… I know you can’t wait! I can’t believe how far LB has come in just a few short months. It’s amazing to watch her and compare her to the little lump (adorable, but a lump nonetheless) she was in January. Time certainly flies, to my delight and horror.